Astonishingly, mind bendingly beautiful guitar. Just... such a characterful piece of top, WOW. How does she sound? Doctor Turn wrote: Astonishingly, mind bendingly beautiful guitar. Just... such a characterful piece of top, WOW. How does she sound? it sounds and plays absolutely amazing!!!! 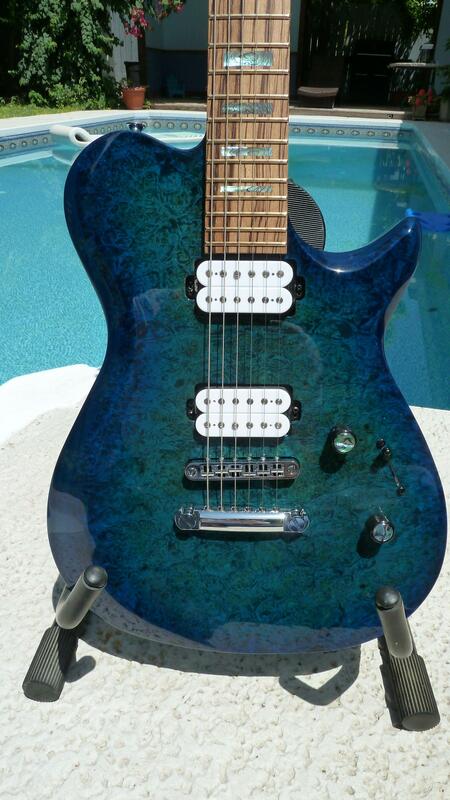 i was so nervous when i placed the order, spent just over $2k but had never played a Carvin /Kiesel.. its so worth it!!! That's fantastic to hear. Really glad it sounds as good as it looks! It's an outstanding guitar! Nothing better than taking a leap of faith, and having it pay off in spades. Did that 30 years ago with my original Carvin 150K, and did the same thing two weeks ago (with a dif brand, though). Don't think I've posted mine in here yet. Here is my Vader VB5 Bass. Translucent Aqua Burl. My dream guitar built personally by Jeff. Congrats on receiving your dream machine! May she serve you faithfully through the years! Re: Burl Club(when nothing else will do)- My Aries Bass 6! Really like how this turned out. Wanted a tortoise shell look. Very pleased. It's the custom Lava over burl maple. Don't know for sure, but seems like I scored a 1 piece top.. I think you def scored a 1 pc top. Sweet 6 string! Doctor Turn wrote: I think you def scored a 1 pc top. Sweet 6 string!